Cat Ellis “Herbal Prepper Live” Audio player below! 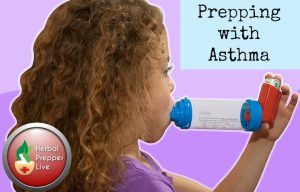 We’re kicking off the first show of the year talking about how to prep with asthma. If you or someone in your group has asthma, or if you are planning to work with your community post-disaster, this episode is for you. Listen to this broadcast or download “Prepping with Asthma” in player below! 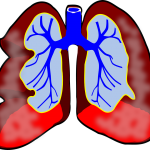 Asthma is an obstructive lung disease. The airways become inflamed and tighten, constricting airflow and making it difficult to breathe. Sometimes, the symptoms are minor, like wheezing and coughing. Other times, symptoms can be severe, even life threatening. Since asthma cannot be cured, it must be managed. This is normally done through prescription medications. But, as we all know, if the grocery store shelves are bare, the pharmacy shelves are too. Whether you are concerned about the escalating tensions between the United States and North Korea, shipping interruptions due to cyber attacks, or loss of health coverage, you need a back up plan for your health. If you are dependent upon a medication for a chronic illness, like asthma, this is the time to be proactive. This is the time to think outside the box. This is the time to put a plan in place to manage your asthma post-SHTF. 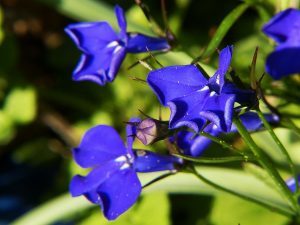 Be sure to check out my website at www.herbalprepper.com to see more information about upcoming shows on my events calendar, plus new herbal and preparedness articles and videos. Archives, website, & more for Herbal Prepper Live HERE! Next: Next post: 5 tips for outdoor shooting range!